Recently, I've been doing a bunch of research on Panzer IV f1's. I am repainting my platoon. They were the first tanks I tried the Tamiya mud stick out on. I loved the mud, but I kinda went overboard and they didn't look that great after. I've been finding a lot of sites with incorrect info about pictures. Thanx to this hobby, I can tell you what almost any tank in WWII was. So, I thought it might be fun if I post some of these pictures I find, and see if you can find the same mistakes I did. Here is the first one. "Panzers of 23rd Panzergrenadiere SS Division, Nederland, in East Germany (1945). They seem to be Panzer IVF1, the short barreled 75mm version for infantry support. (Thanks Mr. Bosscher)"
Name me what you think is wrong with this picture and its caption, and why. Shouldn't be too tough. Lets see how many of us have learned something. I'll reveal my answers at a later date. Sent you my answer via facebook, hopefully I didn't miss anything. The tanks appear to be PzIIIe's. I would put them in Southern Russia in 1941. They might also be in the Balkans in early 41. Not sure about the unit. There was no 'East Germany' when these units were operational? As for what's wrong w/the pic, no clue. 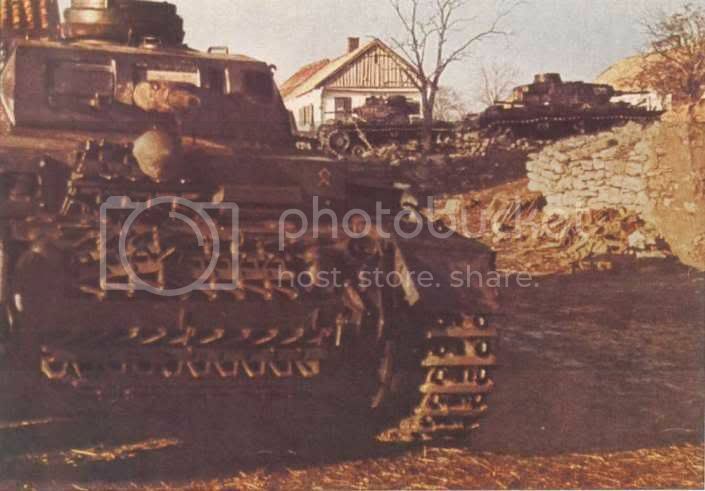 The markings are correct for 23rd SS and they fought at Halbe so the staement seems true in that respect, however as for the tanks they seem suspect as Pz IVsF1s. The MG ball seems more like a Pz IIIAusf.H and the gun mantlet seems to be either an H or an N but the camera angle is iffy, also the driver and radio operators hatches seem to be on the front decking as on a PzIII? I'm not that hot on Panzers in general so I may be completely wrong here! I can see where you might think that is the 23rd ss symbol...but its not. I'm going to post my answers shortly.